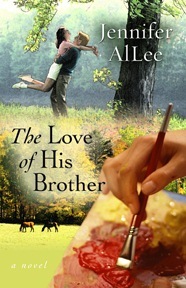 An interview I conducted with Jennifer AlLee, author of The Love of His Brother, which was published by Five Star. Can you give us a basic summary of The Love of His Brother? It’s the story of Whitney Poulten, a young widow determined to grab hold of what’s still good in her life: her family, her faith, and her unborn child. But her plans totally change when Doug comes back. After leaving home years earlier without even a proper goodbye to his family, Doug Poulten’s welcome is anything but warm. But he longs to make things right with his family. When he learns his brother is dead, he turns his attention to taking care of his sister-in-law, Whitney. The last thing either of them expects is for brotherly love to turn into something much more intense… and complicated. It was a long process! I wrote this book in fits and starts. I got the original idea about 20 years ago! But once I got serious about writing, it took about a year to finish, including several rewrites. I went to Montana for a summer, but that was more inspiration than research, since the story idea came after the trip. There's a scene in the book where a foal is being born, so I researched how long it would take, typical equine behavior, that sort of thing. Growing up, I loved Laura Ingalls Wilder, Walter Farley, and Lois Duncan. I had all their books and reread them over and over until they were quite literally ragged. Wilder's sense of place, Farley's attention to detail, and Duncan's ability to weave a tight plot all influenced the writer I am today. Stricter than it used to be! I try to write every day. Monday through Friday, I work on my current manuscript. Right now, I'm working on revisions. I get as much done as possible early in the morning, before my family is running around. But I'm in and out of my office all day, either working on a book, checking emails, or blogging. Women who enjoy an uplifting romance with humorous elements. I know we're supposed to narrow it down to an age group, but I've had a very positive response from teenagers, as well as women on the other side of forty! This past year, I've read mostly CBA books, getting to know my fellow inspirational authors. I loved Elvis Takes a Back Seat by Leanna Ellis, The Sword of Lyric series by Sharon Hinck, Courting Trouble by Deeanne Gist, and Demon: A Memoir by Tosca Lee. That's just a partial list. There are some amazing Christian fiction authors out there today! I've got an awesome family. I've been married to the same husband for 16 years and have an incredible 14-year-old son. They're very supportive of my writing and the time I spend with the imaginary people in my head! My current manuscript is titled The Pastor's Wife. It's about a woman who has to return to the small community she ran from three years earlier... and her pastor husband. It examines how we can get so wrapped up in what we're doing, even things that seem to be "the Lord's work" that we forget the people He's given us to care for. Write! It's the most important thing you can do. Yes, you need to work on your craft. Read books, attend conferences, join a writer's group (joining ACFW - American Christian Fiction Writers - was a turning point for me). But unless you write consistently, you will never grow as a writer. And remember, when it comes right down to it writing is a business, and a quirky one at that. Rejection is part of it. But if you feel called to be a writer, don't give up. Do it for God's glory, and let Him use it as He will. Easier said than done, I know! I'm finally starting to get it after all these years! For more information, please see Jennifer's website at www.jenniferallee.com.